边浩志, 孙中宁, 丁铭, 等. 含空气蒸汽冷凝换热特性的数值模拟分析[J]. 哈尔滨工程大学学报, 2019, 40(2), 426-432. DOI: 10.11990/jheu.201709070. BIAN Haozhi, SUN Zhongning, DING Ming, et al. Numerical simulations on steam condensation heat transfer characteristics in the presence of air[J]. Journal of Harbin Engineering University, 2019, 40(2), 426-432. DOI: 10.11990/jheu.201709070. Abstract: Numerical simulations are conducted to quantitatively evaluate the effects of gas velocity, wall sub-cooling, condensation wall height, and gas pressure on condensation heat transfer. The calculations are based on COPAIN experimental facility and diffusion theory-based condensation model incorporated in the CFD software STAR-CCM+. 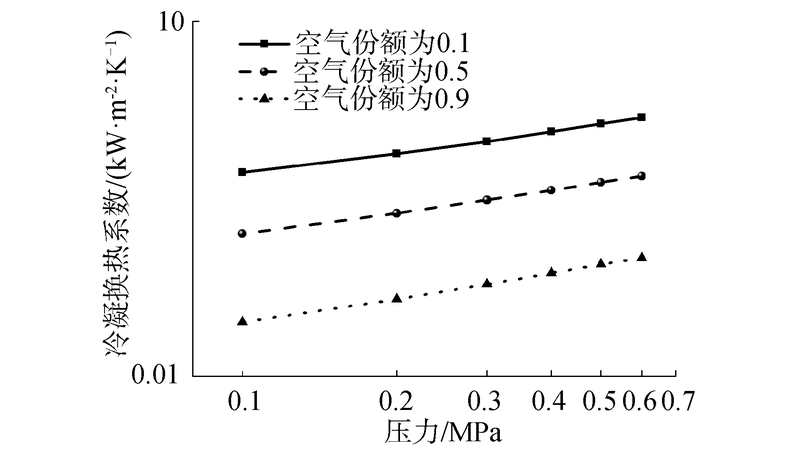 Condensation heat transfer property is evaluated in terms of velocity from 0.1 m/s to 3 m/s, wall sub-cooling from 4℃ to 50℃, condensation wall height from 0.5 to 6 m, and pressure from 0.1 MPa to 0.6 MPa. Results indicate that the condensation heat transfer coefficient is hardly affected by the mainstream gas velocity in the natural convection-dominated region with velocities less than 0.5 m/s. 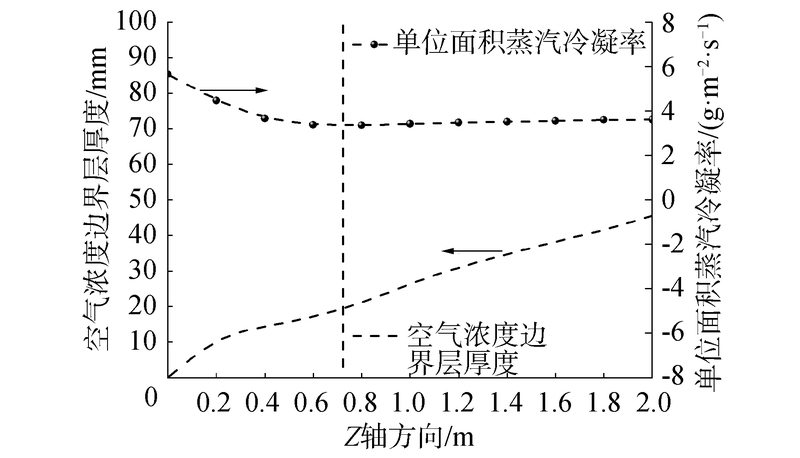 Furthermore, the power exponent of wall sub-cooling can be described by a function in terms of air mass fraction and wall sub-cooling, which ranges from -0.008 3 to -0.367. 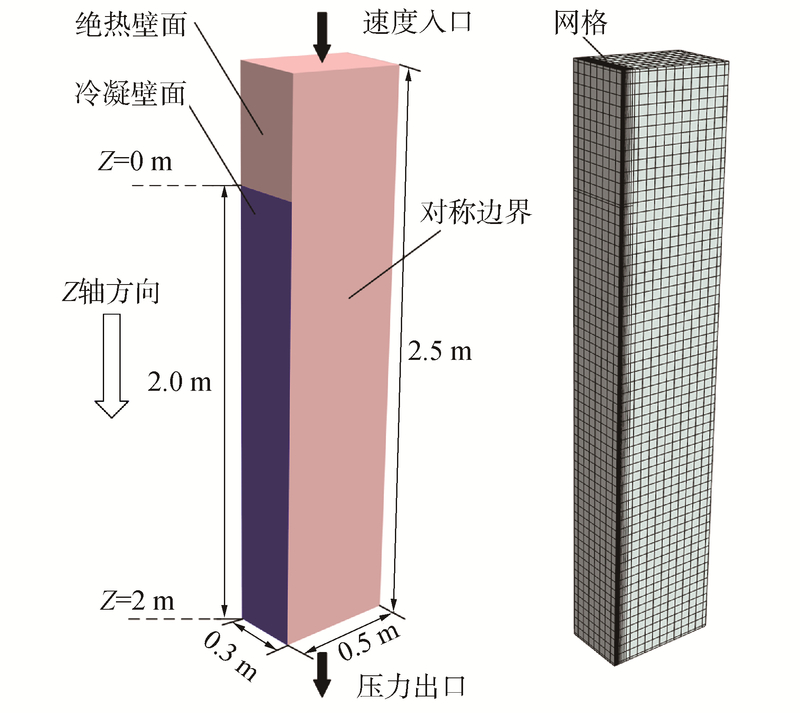 The condensation wall height has an obvious effect on the condensation heat transfer when it is less than 1 m, and the heat transfer coefficient has a 0.64 power direct proportion to the gas pressure. 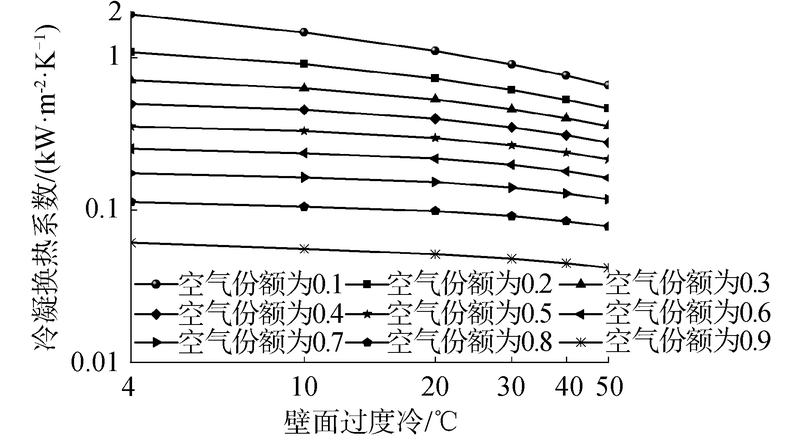 Via numerical results analysis, the quantitative relationship between the condensation heat tranfer porperty and the influencing parameters were concluded, which can to a certain degree promote the understanding of steam condensaiton phenomena in the presence of air. 宿吉强, 王辉, 孙中宁, 等. 含空气蒸汽冷凝传热特性数值模拟[J]. 化工学报, 2014, 65(9): 3425-3433. 宿吉强, 范黎, 高力. 安全壳冷却系统蒸汽冷凝传热研究综述[J]. 原子能科学技术, 2016, 50(11): 1956-1966. 潘丽强, 宿吉强, 范广铭, 等. 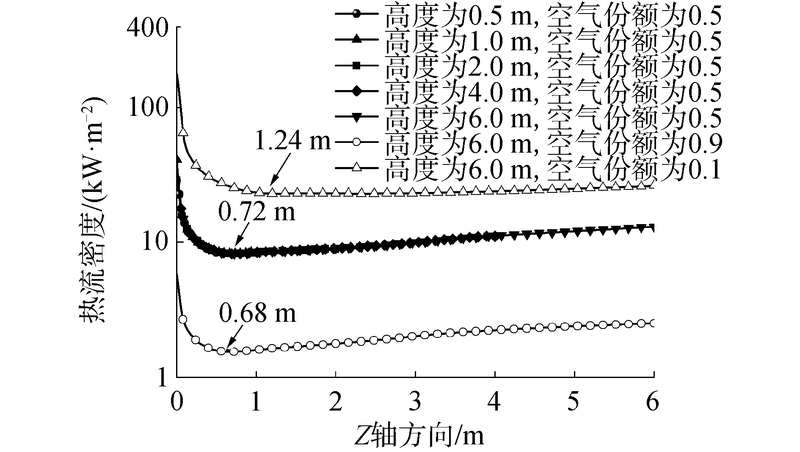 含空气的蒸汽冷凝传热模型研究[J]. 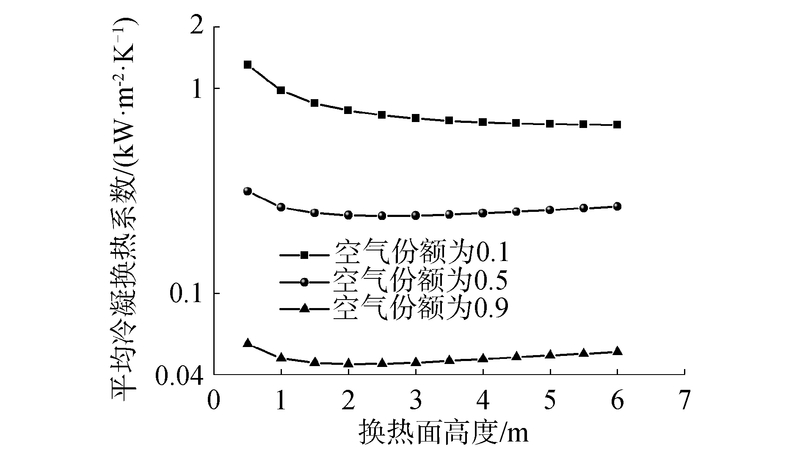 核动力工程, 2015, 36(6): 45-50. 李军, 刘长亮, 李晓明. 非能动安全壳冷却系统设计研究[J]. 核科学与工程, 2018, 38(04): 632-639. 李军, 李晓明, 喻新利, 等. 非能动安全壳热量导出系统设计方案及评价[J]. 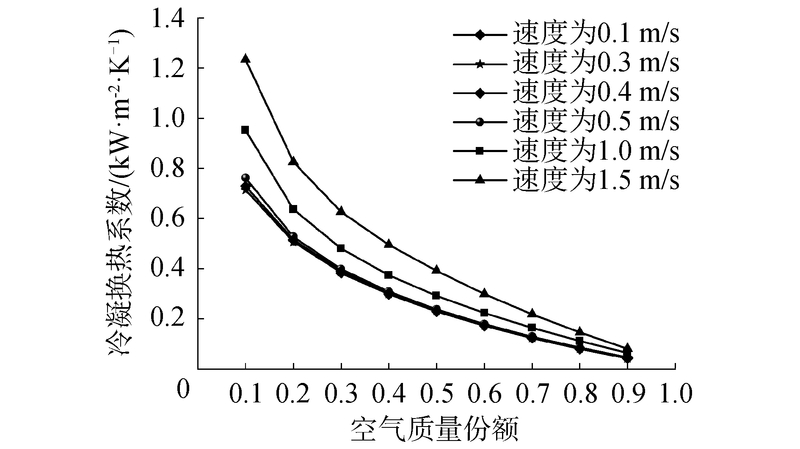 原子能科学技术, 2018, 52(6): 1021-1027. 白晋华, 赵博. 基于Relap5的非能动安全壳热量导出系统优化[J]. 核动力工程, 2017, 38(6): 14-17. 宿吉强, 孙中宁, 范广铭, 等. 含不凝性气体的蒸汽冷凝传热实验研究[J]. 核动力工程, 2014, 35(1): 36-41.